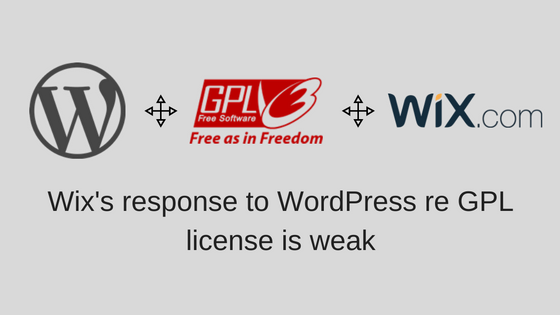 A few weeks ago I wrote a post about Wix, WordPress, the Open Source GPL license, marketing and PR. Because I came out strongly in favor of Matt Mullenweg’s position regarding GPL on that post, many may have deduced that I think WordPress is the best website platform and always the best choice. In fact, when clients approach us about building their websites, I often tell them that we-and-WordPress are not the right choice for them, and they should consider using a hosted site builder like Wix, Weebly or Squarespace. Budget is the number one consideration when building a website. Building and maintaining a WordPress site can be expensive. Yes, you can find freelancers that will build sites for $500, but if you want your site to be built with strategic goals in mind, and want professionals on the other end who can guide the planning process and develop a fast, secure, and optimized site, the price can get steep. And it doesn’t end there. WordPress sites need tender loving care on an ongoing basis: they need to be updated, bugs pop up that need to be fixed, you may need technical support to help you best manage your site, and since WordPress sites are hot targets for hackers, you need professionals to help you make sure you don’t get hacked. That’s why we at illuminea offer our ongoing WordPress maintenance and support package, and while we give value for the cost, it’s definitely not for everyone. Also, managing a WordPress site is a learning curve. Many people need professionals to guide them on managing their WordPress sites, which ends up adding to costs. Wix’s drag and drop interface can be much more user-friendly for many people. Using a hosted service like Wix avoids the above-mentioned costs. 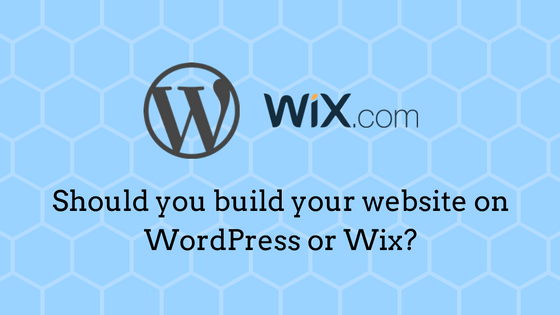 If your site is simple and you won’t be updating the content often, Wix may be for you. With Wix you can plan your site yourself, use one of their templates and easily customize as needed, add your content, and launch. I highly recommend that if you do use Wix, you upgrade and get their domain mapping service so your site sits on your own custom domain which looks much more professional than something.wix.com. (But don’t buy your domain name from them! Keep it separate and buy it from a separate domain registrar. Also, don’t use their email service. But I digress…) Even that upgrade is cheap compared to the costs involved in hosting and maintaining your own site on your own server space. How serious is your online marketing and SEO? Many sites just need to exist so that if someone comes across a link to the site, whether on printed material like a business card, or in an online directory, there’s a site on the other end. These sites are like an online brochure, and for many purposes that’s totally fine. In these cases, Wix can be a really good solution. But if you’re an organization that has long term online marketing and lead generation goals, WordPress is probably the better solution for you. For example, many of our clients at illuminea are B2B, and therefore make extensive use of lead generation forms that integrate with third-party business solutions like HubSpot, Marketo, Act-On and Salesforce. Since Wix is a hosted solution, you don’t have access to your site’s codebase which means that adding these integrations is extremely difficult, or impossible. Yes, they offer a variety of apps that you can install on your site to add features, but these apps can’t take into consideration every marketing scenario. Many of them also cost, so that can add up. With a self-hosted WordPress site (and capable coders), these mission-critical integrations are possible. Per page title and meta description control. XML Sitemap (limited to 500 characters). Ability to add meta code to your site’s header to connect to third-party services like Google Search Console. Open Graph (OG) tags for better and more precise sharing on Facebook. Meta keywords. Uch, why, is it 2001 again? But ok, they’re there. Categories and tags – but they only appear in the sidebar, not on posts. Author pages for multi-author blog or news sites. The ability to exclude pages/posts/post formats/authors/etc. from the sitemap. Support for SSL – this is becoming increasingly important by the day. So if your SEO needs are advanced, Wix is not for you. But if you just need a basic site with basic SEO, Wix now addresses those needs. Does your site have short or long term goals? Many sites are set up for short term goals, like time-sensitive campaigns, events, or minisites. As long as there is little need for business tool integrations like those I mentioned above, then Wix can be a great option for these sites. This is classic vendor-lock-in, which should be avoided at all costs. WordPress, on the other hand, offers excellent tools for both exporting and importing content. Also, if you start with Wix and then decide to migrate your website to any other platform, WordPress or otherwise, you cannot redirect your site’s URLs or authority to the new platform easily. That means that any search equity or authority you built up on Wix is lost. Keep this in mind before you start building up a serious site there: it is almost guaranteed that your needs will outgrow what Wix offers, and then all your hard work is essentially lost. Another issue is the inability to backup your site. I’m sure that Wix’s servers are very secure and stable, but no servers are 100% safe. If you are writing posts on a regular basis and have created many pages of content, those should be backed up off the server…and yet they can’t be. That is really scary. Like so many things, the platform you choose for your website depends on your needs. I hope the above can help you make an informed and educated decision. And if you need any more information about either platform, there are plenty of resources out there. WordPress has a plethora of blogs written by users to help the community, along with the very useful Codex.